High accuracy 5 - 40 MPa (725 - 5795 PSI) 4-20mA output. 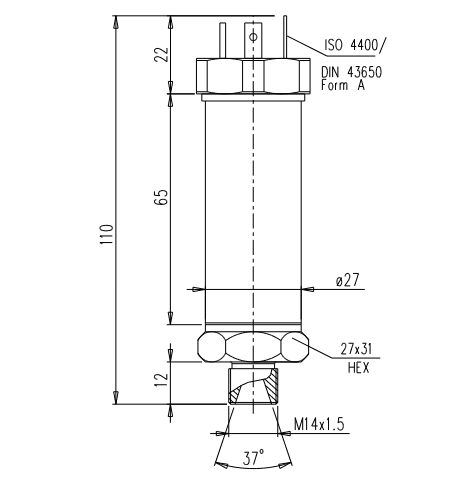 The HPT03 are high accuracy stainless steel pressure transducers sealed to IP67 with M14x1.5 connection and standard ISO 4400/DIN 43650 Form A electrical connections and are suitable for measuring the pressure of all types of non-crystalline liquids and gasses that are not rapidly changing, in industries such as aerospace, automotive, air conditioning, oil and gas. Especially suited for hydraulic pressure measurement. These are made with high accuracy foil strain gauges and are ideal for interfacing with automation and control systems with a standard 4-20mA signal. Each pressure transducer comes with the standard PT Ltd serial numbered accuracy certificate.